Brazil is the largest country in Latin America. It spreads across almost half (47.3%) of South America, and occupies a total area of 8,547,403.5 km2. It is the fifth largest country in the world after Canada, the Russian Federation, China and the United States. Except for a small number of islands, Brazil is a single and continuous landmass. The Equator crosses through the Northern region, near Macapa, and the Tropic of Capricorn cuts through the South of the country, near São Paulo. Brazil's east to west extension (4,319.4 km) is almost equivalent to the distance from north to south (4,394.7 km). The country borders French Guiana, Suriname, Guiana, Venezuela and Colombia, to the north; Uruguay and Argentina, to the south; and Paraguay, Bolivia and Peru, to the west. Ecuador and Chile are the only two countries on the South American continent that do not border Brazil. The Atlantic Ocean extends along the country‚s entire eastern coast, providing 7,367 km of coastline. The official language is Portuguese; the accent and the intonation, however, are very different from what one hears in Portugal and other former Portuguese colonies. Some people say that Brazilians speak „Brazilian‰, just like Americans can say they speak „American‰, and not English. And there are also many Brazilians who are descendants of immigrants and who speak German and Italian, especially in towns in southern Brazil. Brazil ˆ a country which greets visitors with a huge smile and open arms. Because of this massive diversity, Brazil is one of the last places on Earth where no one is a foreigner, where one can change one‚s destiny without losing one‚s identity and where each and every Brazilian has a little of the entire world in his or her blood. This may be the reason why Brazilian‚s welcome people from another land so openly. According to surveys carried out with foreign tourists who visited the country, 97.2% intend to return soon; 56.5% had their expectations completely satisfied; and, for 31.7%, it exceeded their expectations in every way. As you can see, those who come to Brazil become fans on their first visit. All the well know car hire firms have counters at the country‚s main airports and in the main urban centers. Tourists may also book cars through their travel agencies. Why make Brazil your next destination? 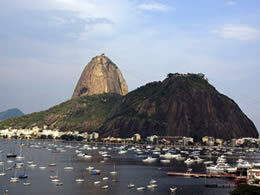 Very few tourist destinations are able to offer such varied options as Brazil. Its natural beauties, the enormous popular festivities and the countless protected environmental reserves are priceless attractions, which amaze foreign tourists when the time comes for them to choose their holiday destination. Everyone has already heard of Rio de Janeiro, Carnival, the Amazon or the country's beautiful beaches. Recent surveys carried out by Embratur (Brazilian Tourism Institute) revealed that the most sought after Brazilian location is Rio de Janeiro. Also called „Cidade Maravilhosa‰, or Enchanting City, this capital of the state of Rio de Janeiro flaunts breathtaking scenery, and is also home to the largest popular festivity in the world: Carnival. This grandiose celebration, a yearly gathering of thousands of merrymakers, who dance and watch the Samba School parades, attracts a significant number of foreign visitors to the grandstands and box seats lining the Marques de Sapucai Avenue. Carnival is also present in the schedules of several other Brazilian cities, attracting the interest of a great many foreigners who visit Brazil. São Paulo follows Rio‚s example, and it too puts on some lively Samba School parades; in Pernambuco, it is the merrymakers of Olinda and Recife who, wearing fancy costumes, dancing in the streets following music groups on floats and maracatus, and carrying the famous gigantic dolls are the ones who stand out; in Salvador, capital of Bahia, the fun is provided by trios eletricos, mobile stages which attract thousands of followers, dancing along behind them, until sunrise, to the sound of the axe music from Bahia. The country‚s beautiful beaches and natural wonders also capture people‚s attention and attract 35% of the tourists, according to surveys carried out by Embratur. With a coastline extending for more than seven thousand kilometres, Brazil has the privilege of being able to offer several leisure options in this segment. Among the most visited in the country, are the famous beaches of Ipanema and Copacabana, on the coast of Rio de Janeiro; Joaquina, in the South of the country, is known for the national and international surf championships held there; Praia do Forte, along the North coast of Bahia, the headquarters for the Tamar Project for the preservation of sea turtles; and the natural beauty of the beaches in the Fernando de Noronha archipelago. And one must not forget Ecotourism, a segment which has attracted a flock of new followers over the past few years. According to data from the Ecotourism Society, average annual growth has been from 10% to15%. Those interested in this type of travel total 5% of the entire world tourist flow, or approximately 35 million people. And Brazil is one of the destinations in this segment showing the greatest potential for growth, since it is where one of the world‚s icons for ecology and biodiversity, the Amazon region, is located -- in the North of the country and spread over some 5.5 million square kilometres. It is estimated that the forests alone in the Amazon region harbour 60% of all life forms on the planet ˆ more than half of which are still unknown to science.